The inventory of newly constructed homes are at historical lows. The U.S. Census Bureau estimates that there are less than 190,000 units available, down from a high of 572,000 units in June 2006. There is also considerable pent-up housing demand or delayed household formations that have not yet been formed due to current economic conditions. A new NAHB study by David Crowe, Robert Denk and Robert Dietz quantifies this level of pent-up demand. Since 1965 the number of households in the U.S. has been growing at about 1.5% per year. 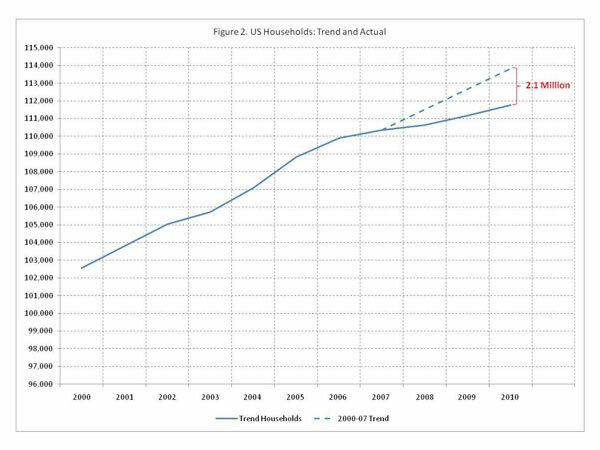 Between 2000 and 2007, the household growth rate was approximately 1.0%. Applying the 1.0% rate against the 2007 Census measure of total households and comparing this trend level to the Census household counts for recent years yields an estimate of 2.1 million missing but expected households that have been delayed due to the Great Recession. Conceptually, these are younger workers who are still living at home with their parents and individuals who have doubled up with roommates due to an uncertain economy. As the labor market improves, these potential households will be unlocked, helping to reduce the excess supply of housing – perhaps faster than many analysts expect.